Chanakya’s Chant is a nice thick book. When you get so much of reading for the modest price 195.00, it is generally a god deal for the booklover. So did it come up to my expectations? I believe it did. Ashwin Sanghi manages to hold the readers interest throughout the 448 page novel and that is no mean feat. 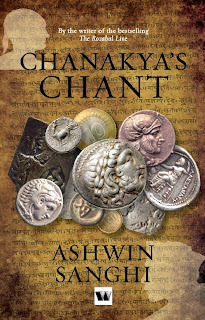 Chanakya’s Chant is a book that tells us two stories simultaneously. It is the story of Vishnu Dutt, the original political thinker this country has produced, better known as Chanakya or Kautilya to the historians. The novel goes back to the distant past (around 300 BC) and tells us the story of Chanakya’s epic lifetime struggle to put his protégé Chandragupta Maurya on the throne of Magadha and unite the entire country under his rule. At the same time a parallel track of the novel tells us the story of Gangasagar Mishra, a modern day Chanakya, who schemes and plots his way through the murky passages of Indian politics to install his nominee, Chandni Gupta (the resemblance to Chandragupta is no coincidence, I believe) on the highest seat the country has to offer.The pace is fast and the interest does not flag despite the fact that the end is a forgone conclusion. Ashwin must have undertaken extensive research to produce this tale of political intrigue, deception, maneuvering, doublespeak and downright trickery as seen through the ages. I enjoyed reading the book but it did leave me a bit dissatisfied. Reason? While the Chanakya story holds interest and offers us glimpse into the distant past, the story of Pandit Gangasagar Misra is a bit jaded and obvious. The situations and the twists are somewhat predictable and give you the feeling of having seen it all somewhere before. The liberal use of cuss words by the historical characters seems odd (to say the least) Now I wonder if the ancients (including the venerable Chanakya) were as free with profanities as the modern day Indians. These little irritants apart, the book is indeed value for money and will be welcomed by fans of Indian English writing. I would rate the book as 3/5.